We were a group of six guys and two ladies. The reception we received from the Explore Indochina team when we first arrived was exceptional. Everything was totally organised –nothing was left to chance. Even the fact that we two “girls” had not had a lot of recent riding experience was of no consequence to them. I was given a bike that was suited to me perfectly. It was a joy to ride – I even wanted to take it home with me I had so much fun riding it. Nothing was too much trouble for the team at Explore Indochina. We had booked two trips: the first eight days was the Middle Road in the northwest of Vietnam; the second for another eight days down the Ho Chi Minh Trail. Absolutely everything was organised to the last detail. We didn’t have to worry about anything: food, accommodation, fuel, etc. Our ever-patient tour leader and our tour guide (a gorgeous Vietnamese “cheeky boy”), who both spoke fluent Vietnamese, made the whole trip a breeze. Also our ever-present mechanic was fantastic – fixing anything that needed attention whenever needed, even on the side of the road or doing an engine change at a service station while we all had lunch. The excitement of not knowing what was around the next corner – buffalo, dogs, pigs, kids, ducks, mudslides etc –was all part of the adventure. 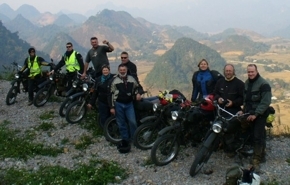 We would recommend a tour with Explore Indochina to anyone looking for an adventure, and we look forward to visiting Vietnam again.